If you're like me there are certain years when Lent starts and you feel less than prepared to begin this time of preparation. Particular years stand out when despite giving Lent weeks of thought before hand I still feel like my efforts fell short or missed the mark. The Essential Lenten Handbook is absolutely essential for those years (as well as being great for those other years when you feel a bit more "on track"). It's filled with traditional and modern practices and prayers that will enrich your spiritual journey and that help each individual put as much into their Lenten progression as they are able each year. The first chapter explains the different ways one can use this book in their spiritual preparations for Easter. Three models are given: The Traditional Model, which includes repetition as a useful part of your spiritual preparations, The Contemporary Model, which uses the Word of God, guided by the liturgical calendar as a starting point for your spiritual preparations and the Family Model, in which the family agrees to share their spiritual preparations together (even if they use different models individually). I was surprised when the contemporary model was actually the most appealing to me (although I'd love to convince my whole family to take part in the family model when Paul isn't insanely busy with Law School and the girls are a bit older! I had a feeling suggesting adding anything to his schedule wouldn't be looked on kindly during his year as an L1!). The second section of the book was one I read twice, once before Lent began and then again during Lent. It talks about the meaning of Lent and gives a short history of Lenten preparations. Explanations on everything from the scrutinies to the traditions acts of prayer, fasting and alms giving are given, along with a more in depth explanation of penitential living, which is reinforced with key references to scripture, particularly focusing on penitence in the psalms. After deepening our understanding of the history of Lent and the importance of penitence, you're ready to move forward into the sections on the practices of Lent and implement them in your own Lenten journey, using whichever model you originally decided on as a guide. Saint Alphonsus Liguori's Way of the Cross is given in the Traditional Practices section, along with a Family Centered Way of the Cross during which the Stations are reflected on with brief, simple prayers over the course of the weeks of Lent in the Contemporary Section (so you meditate on each station for several days before moving on to the next on). The Traditional Method also includes Saint Alphonsus Liguori's Lenten Meditations, a section on Lenten Reconciliation Services, a Traditional Examination of Conscience that leads the penitent through each of the ten commandments to help them understand more fully what each commandment entails, a section on visiting the Most Blessed Sacrament and the Little Chaplet of the Five Wounds of Jesus Crucified. It also includes Saint Alphonsus Liguori's Rule of Life, to help us structure our days, which includes everything from praying as soon as we wake in the morning, to visiting the Blessed Sacrament daily and daily time devoted to spiritual reading (along with much, much more!). And of course, this section is filled with traditional prayers to be prayed on your Lenten Journey. A section on Lenten Family Graces includes special prayers and suggested additional scripture readings for Ash Wednesday, the Fridays in Lent, the Triduum and Easter Sunday (my goal for next year will include following this section together as a family, no matter how busy everyone is!). As in the traditional section there are plenty of modern prayers that accompany the Contemporary model. Much of the book is devoted to daily meditations that I was excited to discover match the liturgical cycle of the year (it took me a few moments to realize that the meditations matched the cycle as I excitedly opened to this section and began immediately looking for the daily meditation, without reading the instructions! I did realize that first night that there were cycles however, which is a step in the right direction for someone with my flaw of skimming instructions to get to the meat of the activity!). I would strongly recommend this book to anyone who's looking to deepen their understanding of Lent and their experience of penitential living as they prepare their hearts for the resurrection of Our Lord at Easter. One of the most wonderful things about it is that you can put differing levels of effort into your Lenten journey, by adding and incorporating prayers and practices that may someday be remembered as family traditions. It's packed with information and I know that I will be able to read it year after year, while still learning and growing and discovering new sources of inspiration. This review was written as part of a Catholic book review program as a Tiber River Reviewer! 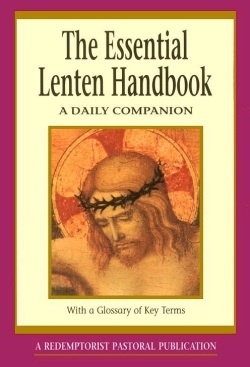 I was provided with a copy of The Essential Lenten Handbook in exchange for my honest review.